All attendees are able to cast their vote for the best conference poster. All posters are eligible to receive a vote. The winner of the Best Poster Award will receive a certificate, and their name will be announced to all conference attendees after the conclusion of the conference. 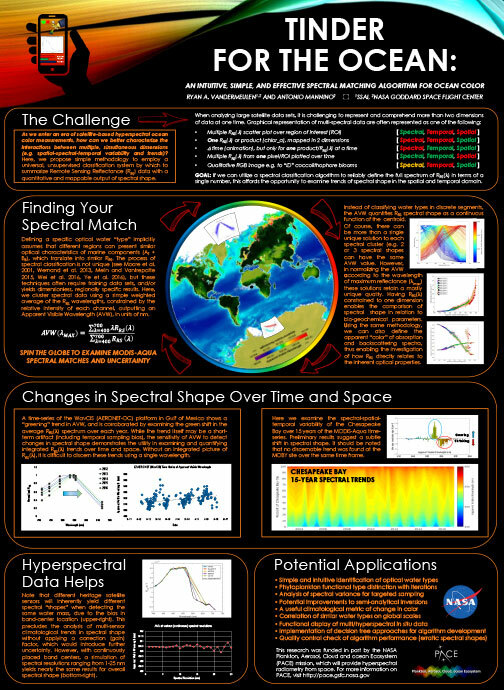 This interactive poster featured a spinning globe that enabled conference attendees to explore global uncertainties of Remote Sensing Reflectance (RRS) and Inherent Optical Properties (IOPs) derived from a new spectral shape algorithm. This work proposes methodology to employ a universal, unsupervised classification system by which to summarize RRS data with a quantitative and mappable output. The simple weighted average of RRS wavelengths, constrained by the relative intensity of each channel, outputs an Apparent Visible Wavelength (in units of nm) that can be computed for any spectral data set. This tool is a simple and robust way for users to visualize and quantify trends in full spectral RRS in terms of its apparent dominant color, which, inherently relates to a specific spectral shape and a unique combination of absorption and scattering properties. Utilizing spectral classification to reliably define the full spectrum of RRS in terms of a single number subsequently affords the opportunity to demonstrate subtle trends of spectral shape in the spatial and temporal domain (e.g. how and where the color of the ocean is shifting over time).